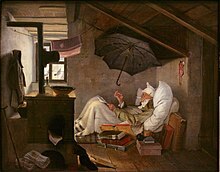 A garret is a habitable attic or small and often dismal or cramped living space at the top of a house or larger residential building. In the days before lifts (elevators) this was the least prestigious position in a building. In this era, the garret often had sloping ceilings. The word entered Middle English via Old French with a military connotation of a watchtower or something akin to a garrison, in other words a place for guards or soldiers to be quartered in a house. Like garrison it comes from an Old French word garir of ultimately Germanic origin meaning to provide or defend. 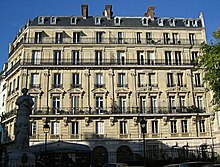 In the later 1800s, garrets became one of the defining features of Second Empire architecture in Paris, France, where large buildings were stratified socially between different floors, as the number of stairs to climb increased. Garrets were very often internal elements of the mansard roof, often with skylights or dormer windows. A 'bow garret' is a two-storey 'outhouse' situated at the back of a typical terraced house often used in Lancashire for the hat industry in pre-mechanised days. 'Bowing' was the name given to the technique of cleaning up animal (e.g. rabbit) fur in the early stages of preparation for turning it into hats. What is now believed to be the last bow garret in existence (in Denton, Greater Manchester) has now been listed in order to preserve this historical relic.